he Knowles House Inn. A Historic Key West Bed and Breakfast Accommodation A Key West Bed and Breakfastâ€¦.. Not just any Key West Bed and Breakfast, the Knowles house is relaxing and romantic. If you are traveling to tropical Key West Florida then the Knowles House Bed and Breakfast will make your stay in Paradise a perfect one. This ideal Bed and Breakfast has a combination of island style accommodations, a friendly atmosphere and casual comforts that keep the guests of this Key West Bed and Breakfast coming back again and again. This friendly Key West Bed and Breakfast is refreshingly different from other Key West Guesthouses. It is a charming, restored and elegantly furnished, mid 1800â€™s conch house centrally located in a handsome residential historic district of Key West Florida. Being only five blocks from Duval is ideal. The Knowles House Bed and Breakfast has a great Central Old Town location. Only two blocks from the Ft. Myers, Marco Island and Miami Ferry Terminal, this charming Key West Bed and Breakfast is also just short walk to Duval Street's fantastic tourist attractions, shops, clubs and restaurants as well as to the quaint Historic Seaport boardwalk. Our historic inn is close enough if you want the hustle and bustle of lively Duval Street, but far enough away for a little peace and quiet. Enjoy a lazy, romantic stroll home to Knowles House Bed and Breakfast Inn from Duval Street or Mallory Square along the Historic Seaport boardwalk or past Eaton Street's famous array of historic houses. The elegant Key West Bed and Breakfast guestrooms offer a range of different types of accommodations to suit your varying needs and budget. The small size of the bed and breakfast allows the onsite owners Paul and Les time to concentrate on the personal touch. 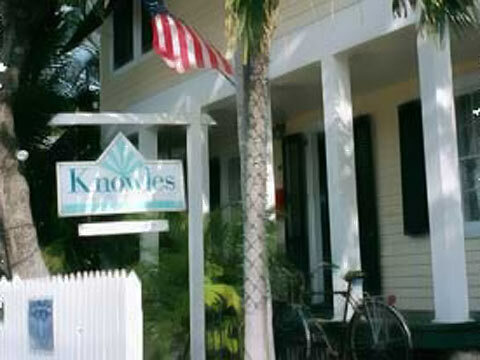 key west bed and breakfast key west hotel bed breakfasts key west hotels travel accommodations bed-and-breakfast lodging vacation guesthouse knowles house inn FL B & B inn elegant key west gay bed and breakfast On site owners Paul and Les make an incredible Key West Bed and Breakfast Team. Their love and knowledge of Key West Floridaâ€™s best entertainment, restaurants and water fun gives this Key West Inn a great welcoming environment. These innkeepers will provide you with information and outstanding concierge services to create your perfect Key West Bed and Breakfast vacation. Even if this is your first time to Key West Florida or your first time at a Key West Bed and Breakfast we are happy to share our little piece of paradise with you.